This Wednesday, Istanbul was submerged in more snow than I've seen the entire five years I've been here and the city was pelted with snowstorm after snowstorm. It was the kind of snow that turned adults into children, chucking snowballs barricaded behind parked cars. Snowmen of all shapes and sizes cropped up around the city and the streets became slippery ice luges. I decided to push myself out of the warmth of my house to take a walk through the rare wintry landscape and headed on the metro towards Yenikapi to check out the same neighborhood in Fatih- Vefa- I'd been to last week on the snow day and take some snowy pictures. As the metro passed over the Golden Horn, I gaped at the snow dusted domes and the buildings, each donning bright white caps. My first stop was Kalenderhane Camii off of the Vezneciler metro stop. It's another site in Istanbul with varied pasts, having once been the site of a Roman bath, a string of churches, a Dervish soup kitchen after the fall of Constantinople, and finally, in 1746, a mosque. As I walked up to the mosque, the sky unleashed a fresh batch of flakes. I'd worn a more water-proof pair of boots this time, and crunched through ever deepening snow on the steps down to the mosque's entrance. What was most striking about the interior of the mosque was it's barren beauty. It was elegant and intimate in its simplicity. It's exposed brick arches, pink rimmed windows, and lack of overly-ornate decorations created a welcoming and warm space. The building retains details from its past incarnations in the Byzantine brickwork, details above its pillars, and carved-stone trim. 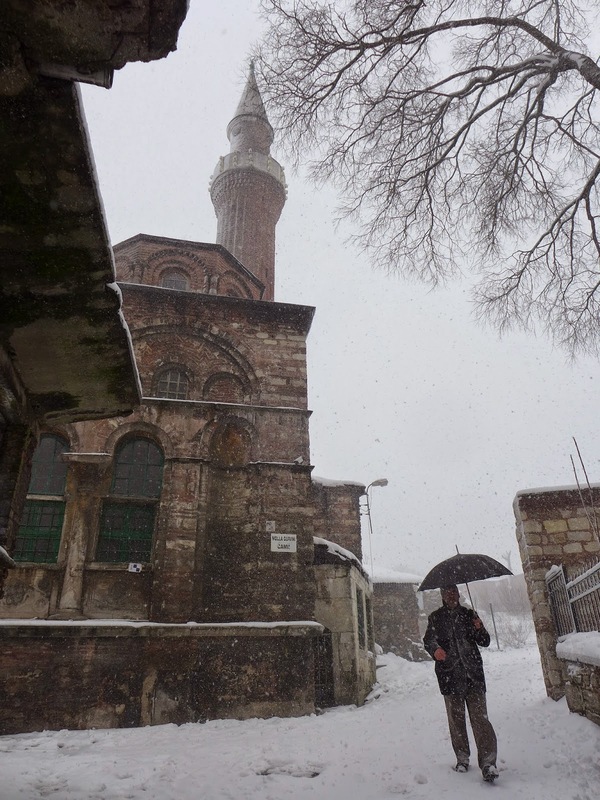 Walking out of Kalendarhane Camii, I found myself in a full-fledged snow storm. It was thrilling to see the city whited out and so I continued walking. After taking a few unfamiliar turns, I returned to the site of Molla Gürani Camii. 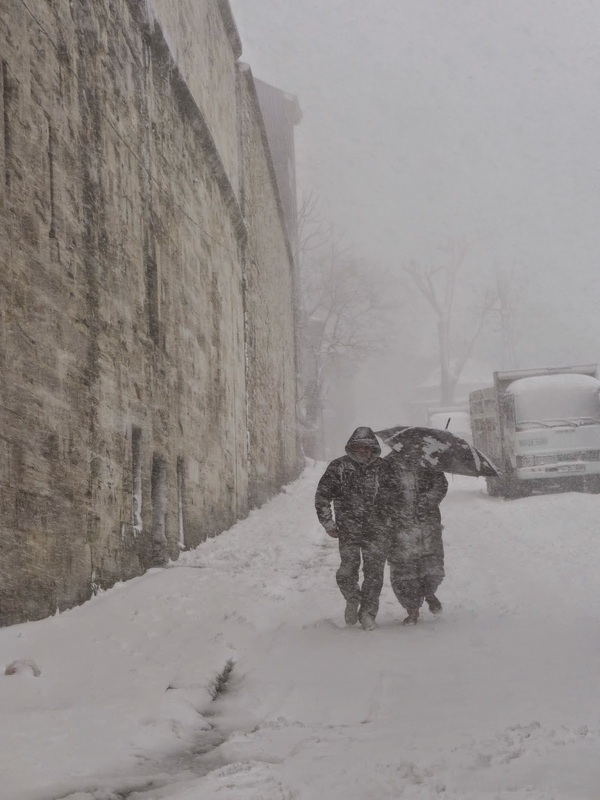 A man struggled to drag a cart with bottles of boza uphill in the snow and was soon helped by another man. The snow reached my ankles and I shuffled towards the side of the mosque. I had my Holga on me and snapped a few pictures with it. I went back to the cemetery to see how the tombstones looked under a fresh blanket of snow. Turning back towards the mosque, I ran into two photographers on the mosque's steps. They were Erhan Uçar and Şevket Şahintaş and were in the neighborhood, working on a documentary on the Syrian refugees living there. We chatted for a bit and they invited me to join them on their photography walk. I gladly followed, sure that the experience would be out of the ordinary. A street behind the mosque was a row of abandoned buildings, gutted out skeletons of their former selves. The icy wind whistled through and blew up clouds of snow from their floors. Looking more closely, I saw that there were children playing there and after a little more observation, saw that there were entire families occupying these cold structures. Clotheslines hung from walls and the ice wind danced with the suspended clothing. A few kids came running out to interact with the photographer, in clothes inadequate for the gripping cold, asking for money. I stared down at my thin, but waterproof shoes and cringed in seeing some of the children with sandals in the snow. We continued our walk around the block and the snow continued to beat down, ever-more harshly. After 15 more minutes, I felt frozen to the core. We stopped into a small neighborhood bakkal to get out of the snow and to ask for some tissues to wipe our camera's lenses. We stepped back into the cold. After another 10-15 minutes, we stopped into a local kahve to warm up with some çay. It looked like a plain building from the outside and I would never have known there was a kahve there if my new friends hadn't pointed it out. It was the kind of place where men go to be with each other. A few active card games were in session, while another group crowded around the foosball table. I was the only woman and foreigner in the joint, and sparked some curious stares. I felt that I was a bit of intruder in a space reserved for men that I usually would not been have allowed to be without two men, but enjoyed getting an inside view of this Turkish man cave. A few çay later, we were back on the streets for more shooting. The storm had cleared to reveal a bright blue sky, and the sun shone down for a little while. Bright white clouds rose from the buildings, mirroring the snow-carpeted streets. This only lasted a few minutes, before the sky closed up again and snow came pouring down anew. I stayed with the photographers a little while longer, making our way downhill towards the new bridge built for the metro to cross the Golden Horn. We came down to the bottom of the hill, where many Syrian refugees were out in the streets, kids playing with the snow- their exposed feet and thin layers in the snow, a reflection of their stark reality in Istanbul. I had an appointment to keep and so only stayed a few more minutes before making my way towards the metro. I stopped a moment in my house to warm up before heading out again, realizing how much I take for granted.